Orchid Story - Calling all "survivors of life". Take the survey to be entered to win this book and pens! Calling all "survivors of life". I show up here each week to show you that it's possible to work through the stumbling blocks that life throws at you. That even when you feel like you are being pelted, pelted, with obstacles, there is still room for you examine your story and improve your emotional and mental well being. I love to connect with you. I love bearing witness to your stories as you vulnerably face them. I have grand plans for Orchid Story. But they only work if I am understanding who YOU are and how to serve YOU. With that in mind, I created a quick, 5 minute survey that I want you to complete. Click the button below to get to the survey. To entice you I have a fun gift box for one lucky winner with a copy of “Your Brightest Life Journal: A Creative Guide to Becoming Your Best Self” by Caroline Kelso Zook (pictured above), a set of 10 Staedtler colored pens, and a $5 Starbucks gift card. The perfect kit to take with you for me time at the coffee shop. Just complete the survey to be entered. You must provide your name and address where indicated on the survey to be entered to win. 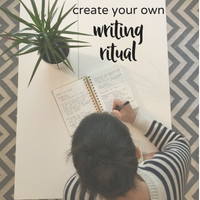 Create a writing ritual. Find time to write. Go you! Here’s your worksheet. Now, promise you will print it, find five minutes to work on it, and then put it into practice! I’ll include you in my weekly letters so that you’ll get the most from our Orchid Story community, the Greenhouse. You can unsubscribe anytime you like. Click here to get back to Orchid Story inspiration.